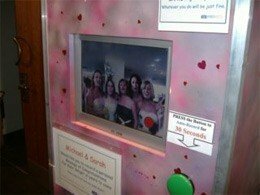 Your Wedding guests, whether family or friends record their messages via the VideoBooth. It's dead easy to use, they just press the record button and leave a 30 second video message - they can record as many times as they like! Some of the messages are serious, some funny and some plain weird(! ), but most of all, all are memorable. If you like the idea already, don't forget that the extra included with the package is the fact that all the messages are recorded separately and provided for you on an extra disc. This disc once placed in your PC can be accessed and the individual clips can be ‘e-mailed' to your friends & family wherever they may be! Have a series of lasting video memories from your wedding on DVD ready to share together for the rest of your life!